The Benjamin Franklin Parkway on the morning of Tuesday, March 14, 2017. 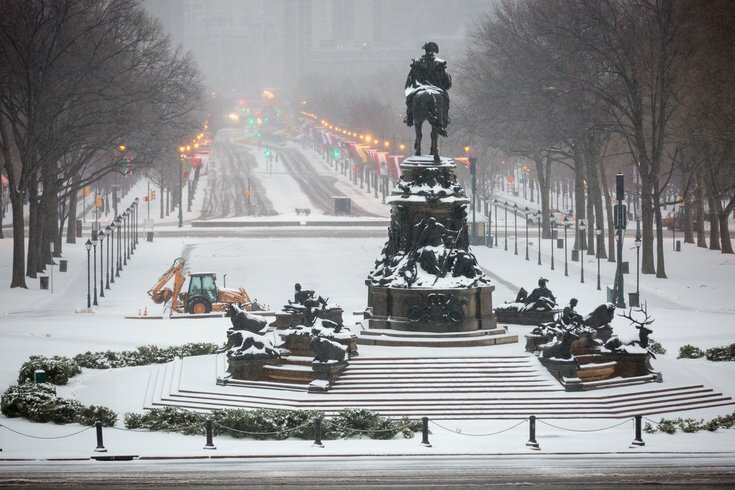 Philadelphia's forthcoming winter currently sits in no man's land. When meteorologists at the National Weather Service's Climate Prediction Center look at seasonal forecasts, they look at the likelihood of a region to get more or less precipitation than the seasonal average. If, using their model, an area doesn't appear to be leaning either way, it falls into a category called "equal chances." That's where the Delaware Valley's 2017-18 winter forecast resides. Is it ok to eat the snow? In terms of precipitation, "there isn't a strong enough climate signal to suggest one way or another," Ray Kruzdlo, a meteorologist and hydrologist with NWS Mount Holly told PhillyVoice. There are, however, other indicators forecasters can look at to get a general idea of how much snow may coat the region, which sees about 22 total inches of snow on average annually. NWS officials are predicting a La Niña phase, or cooler Pacific Ocean temperatures, to begin this week. La Niña and its opposite phase, El Niño, are scientific terms for fluctuations in temperature between a region of the Pacific and the atmosphere that can have worldwide climate impacts. "In general, when you compare La Niña versus El Niño, there's typically less snowfall," Kruzdlo said. "El Niño patterns are snowier patterns." Additionally, the region is expected to be slightly warmer than normal from December through February. So, if you had to put money on whether the Philadelphia region will get more or less snowfall this winter, you'd probably want to take the under. "The combination of the fact we're expected to be slightly warmer (this winter) running into a La Niña pattern, you could certainly infer from only those two things there's a greater likelihood of less snow," Kruzdlo said. It's no certainty, Kruzdlo noted, but the "general consensus" at Mount Holly, based on information from the Climate Prediction Center, is that snow levels will be either at or below normal. If you're hoping for a date on which Philadelphians can expect the first white dusting of the season, you're out of luck, at least from government weather officials. "There's nothing that suggests it begins to snow on this particular day or date," Kruzdlo said, adding that regional NWS branches only forecast seven days out. For those unsatisfied with that answer, Weather.com used 30 years of NWS data to find the average first snowfall date in cities across the country. In Philly, Dec. 17 is that day.